If you are planning a, local move there are a variety of options and services to choose from. The size of your move, your budget, and your desired convenience are all factors to consider when choosing the local moving method that's best for you. The following guide will give you more information on the available options when moving locally so you can make the right choice and start your planning today! Considering a DIY move? 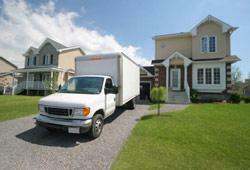 Renting a truck, loading and transporting your own belongings is a popular option for local moves. You can also call rental truck companies with a description of your shipment to get a recommendation for the truck size best suited for your move. It's a good idea to rent a truck at least 10 to 15 percent larger than what you think you'll need to ensure you will have enough space. What is the cost per mile? How much gas must be in the tank when I return the truck? If you're forgoing moving services and handling your relocation on your own, that means dealing with all of the heavy lifting and hard work. You can opt to hire moving labor to lend a hand or simply ask a few strong friends to pitch in. Obtaining the proper moving tools can make the task much easier and prevent the risk of injury or damage to your goods. Don't carry more than you can handle. Always ask for help and make sure you don't take on more weight than you can support safely without straining. Wear appropriate clothing. Moving day attire should be unrestrictive so you can easily move but not too loose fitting that it can become caught or cause a tripping hazard. Wear sturdy, closed toe shoes to protect your feet and make laces are neatly tied at all times. Always lift heavy items properly. Lift with your legs and always bend with your knees, not your waist. Carry heavy boxes and furniture close to your body, and make sure your path is always clear and unobstructed. Always use your turn signal, and signal as soon as possible before turning. Never pass cars on hills or curves, and avoid making sudden stops or changing lanes abruptly. Never tailgate--keep at least five car lengths between your truck and the vehicle in front of you. Be wary of overhead clearance restrictions--the truck will require at least 14 feet of clearance to safely pass. If cost is not as important to you as convenience, you may be considering hiring full-service movers. Letting the professionals take care of everything will ensure that all of your belongings are packed with professional materials, disassembled properly, and loaded into the truck correctly to limit damage during transit. Local movers usually charge a flat per hour--so the cost of your move will depend o the time amount of time it takes to pack up your home, transport your shipment, and unload it all at your new place. The larger your home and the further the distance, the longer it will likely take to complete your move. Before choosing any mover for hire, there are a number of essential questions to ask to ensure they are trustworthy, reputable, and the best company for the job. You should also conduct a thorough background check on the company and read online reviews to make sure they have a reputation for professional service and no outstanding complaints. What kind of estimates do you provide? Before choosing any company for hire, make sure to receive at least THREE in-house estimates from three different companies. The more options you have to compare, the better your chance will be to secure both the best price and service for your move. However, remember that while choosing the mover with the lowest quote is tempting, if the rate is drastically less than their competitors, it can be a red flag for a moving scam. Rogue movers will often provide a very low quote to ensure service, the hike up the cost dramatically before delivery. That's why it's imperative to get your estimate in writing. Receiving an on-site quote is important for accuracy. You should never trust an estimate given over the phone because the mover cannot properly assess your belongings or the time it will take to complete the move. Moving companies offer one of three kinds of estimates: binding, non-binding, and binding-not-exceed. Always clarify which type you are being offered before hire. Renting portable storage. Need a mixture of convenience and affordability? You could always rent a portable storage unit to load at your leisure on your property. When you're ready, a driver will pick up the unit and deliver it to your new home. Hiring moving labor. For a partial DIY move, you can hire moving labor services to aid with loading, unloading or packing. Cheaper than full-service movers, moving laborers can help you load your rental truck or portable storage unit, disassemble and reassemble furniture, or pack your belongings. Hiring small movers. Moving the furnishings of a small apartment or just a few items? Small movers specialize in transporting shipments under 2,000 pounds. You can often enlist their services if you require assistance with just one difficult item, such as a piano, pool table, grandfather clock or piece of antique furniture. How Much Does a Local Move Cost?